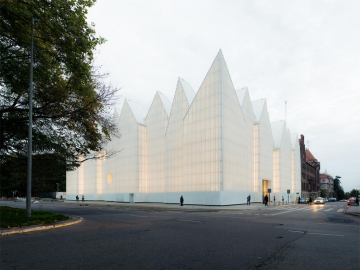 The new Philharmonic Hall of Szczecin is located on the historical site of the "Konzerthaus" and recomposes an urban corner in a neighborhood near to the historic city. The building houses a symphony hall for 1000 spectators, a hall for chamber music for 200 spectators, a multifunctional space for exhibitions and conferences, and a wide foyer. In its materiality, the building is perceived as a light element: the glass facade, illuminated from inside, allows different perceptions. 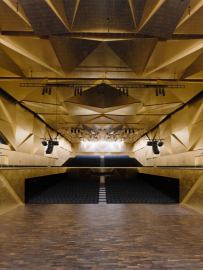 The exterior austerity and the simple composition of the interior circulation spaces contrast with the expressiveness of the main hall and the concert hall with its gold-leaf covering. 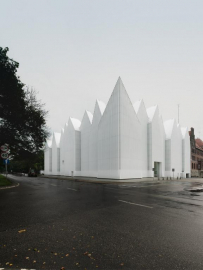 The new Philharmonic Hall of Szczecin is located on the historical site of the "Konzerthaus", which was destroyed during Second World War and recomposes an urban corner in a neighborhood near to the historic city. The building houses a symphony hall for 1000 spectators, a hall for chamber music for 200 spectators, a multifunctional space for exhibitions and conferences, and a wide foyer, which can also be used to host events. 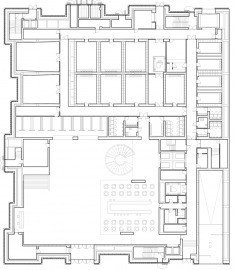 The building is configured by a synthetic, but at the same time complex volume, which is resolved through a continuous promenade, which connects all these functions along a single public path through all the levels of the building. Externally, as in the adjacent pre-existence, the verticality and geometry of the roof prevail. These characteristics identify the Philharmonic Hall with its surrounding context. The plan composition is defined by a perimetral ring. This element mostly hosts service spaces. 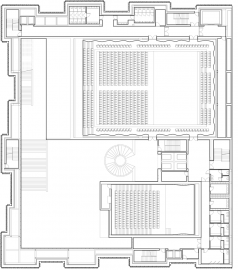 On the one hand this allows to define a large void within which gravitate the symphony hall and the hall for chamber music, on the other hand to shape the relationship of the building with its surroundings. 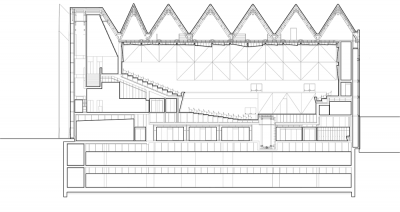 The serial modulation of the roof represents the only other expressive element, that permits the integration of the building within the fragmented urban profile of the city. In its materiality, the building is perceived as a light element: the glass facade, illuminated from inside, depending on the use allows different perceptions. 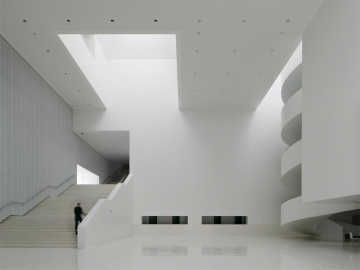 The exterior austerity and the simple composition of the interior circulation spaces contrast with the expressiveness of the main hall. In accordance with the central European tradition of the classical concert halls, decoration becomes ornament and function. The hall is composed following a Fibonacci sequence whose fragmentation increases with the distance from the scene, and gives shape to an ornamental space which reminds of the classical tradition through its gold-leaf covering. The building predominantly adopts passive systems of energetic control. The main element is the double skin façade channeling a large part of the installation system to provide a global acoustic insulation and a natural ventilation to avoid overheating. Illuminated by a LED system, it turns the building in a glowing volume with a minimum energy consumption. 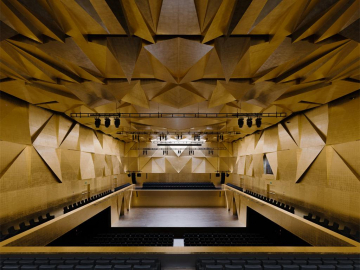 The roof cladding is a multilayered pack, with differences over the concert hall than other zones, to optimize acoustics and thermal insulation. Collaborator (external): Studio A4 sp. z o.o. 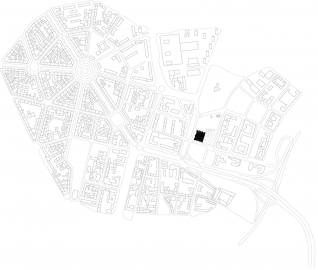 , Jacek Lenart Project architect: Pieter Janssens, Agnieszka Samsel Collaborator (office): Marta Grz?dziel, Isak Mayor, Petra Jossen, Cristina Lucena, Cristina Porta, Ruben Sousa Structural engineering: BOMA S.L. 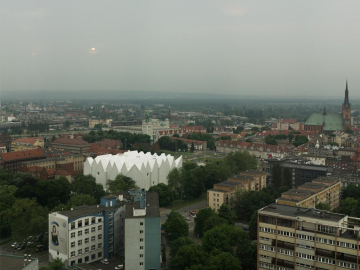 , FORT POLSKA Sp. z o.o. Climatisation: GLA Engineering Sp. z o.o. Electrical: ELSECO Sp. z o.o. Acoustical: ARAU ACUSTICA Façades: FERR Lighting: ANOCHE Iluminaci Construction company: WARBUD S.A.